Submitted by lynn on Wednesday, March 19, 2014 - 9:15am. I've always enjoyed cooking but generally stick to recipes from cookbooks or online recipes. On occasion I'll throw together my own recipe based off previous experience and either smile at the tasty results or take mental notes of what to do better next time. Nothing has really been written down before. With a little push from local food bloggers Barbara and Jackie, with ingredients from Melissa's Produce, this is my first recipe! Melissa's Produce Challenge: Together with a few other San Diego food bloggers, we were each sent a box of produce and were to use 3-4 of the ingredients to create a recipe. 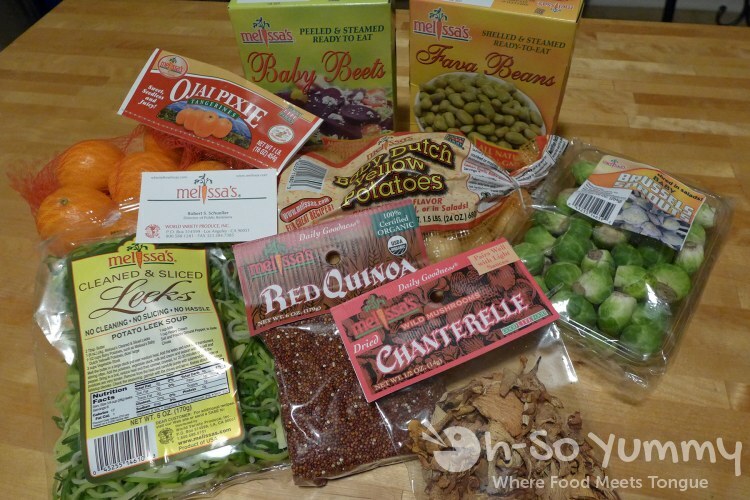 The box included included Dutch Yellow Potatoes, Cleaned and Cut Leeks, Baby Brussels Sprouts, Ojai Pixie Tangerines, Steamed Red Beets, Steamed Fava Beans, Dried Chanterelle Mushrooms, and Red Quinoa. I wanted to make something that wasn't too complicated and was relatively healthy. I also wanted ingredients that were at least somewhat familiar to me so I chose brussel sprouts, leeks and the red quinoa. I also had some fully cooked turkey bacon in the fridge that I needed to use. Near the end, I decided to throw in some almonds for a little more protein and this is what I created! Prepare the quinoa according to package directions. Rinse the quinoa with cold water, strain and place in a pot. Add 2-1/4 cups of water. For more flavor, use broth instead of water. Bring to a boil. Reduce heat, cover and simmer for 20-25 minutes, or until quinoa absorbs all of the water. Fluff with fork. While the quinoa is cooking, heat the oil in a medium sized pan. Add the leeks and cook for about 2-3 minutes on medium-low heat. Add the garlic and saute for about 1 minute. Add the turkey bacon and brussels sprouts and saute for 5-7 minutes, or until they get crisp tender. Add salt and pepper to taste. Toss in the almonds and stir through. Remove from the heat. To serve, scoop the quinoa onto a bowl or plate and top with the brussel sprout saute. Enjoy! Bacon and leeks are so good together. 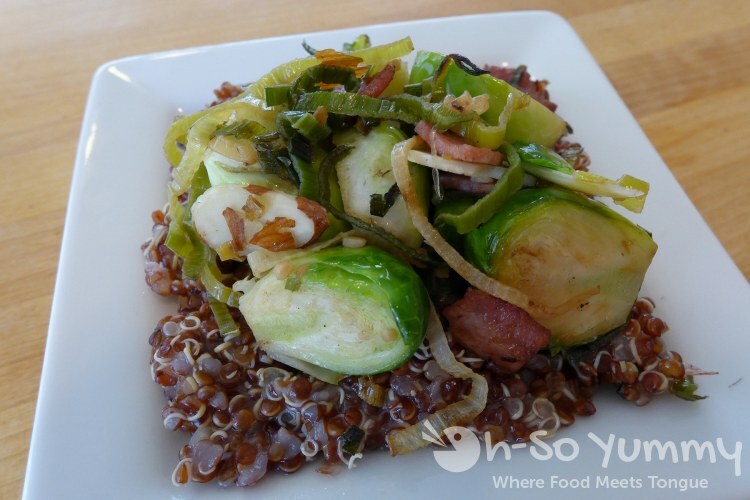 What a great way to make bacon "healthy" by pairing it with quinoa and brussels! Your dish looks amazing! Makes me want to jump right in!! Looks delish! Btw since you and Faye's blogs are focused on SD restaurants, what are the top 5 SD restaurants on your list? Like if anyone was visiting SD for the first time, which places would you recommend as a MUST GO? Do you Yelp your reviews on Yelp as well? I've been Yelping regularly since last year, but Yelp does have its flaws and limitations. I do not write reviews on yelp but I've seen that they have events for elite yelpers which makes me curious. I also prefer being able to edit my posts whenever I like which I can only do on my own blog. Everyone's food preferences are different but I'll send you a list of my personal favorites through your website. Congrats on your first recipe and thanks so much for being part of our 1st ever Melissa's/San Diego Food Bloggers' Surprise Box Challenge!